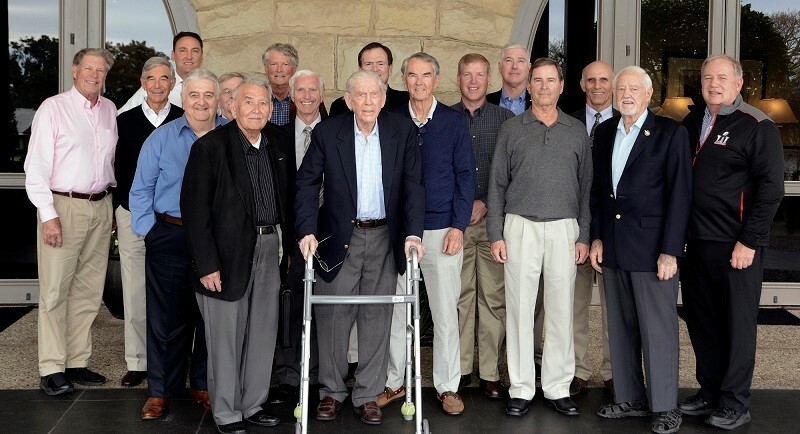 Montecito, Calif., March 31, 2017 – Seventeen pilots, current and former, came together at Birnam Wood Golf Club for a luncheon in February to bond over stories of flying and catch up on the latest in military and aviation. Coordinated by the Pierre Claeyssens Veterans Foundation, the luncheons have been occurring several times a year for more than five years. Most of the attendees are local, but one hailed from as far as San Diego. Gen. Bill Begert - who served as commander for the Pacific Air Forces, among many other leading roles in the Air Force - provides military briefings and the latest news on the warfront, new weapons and aircraft. Begert is also a member of the PCVF Board of Directors. Some of those who attended help with the flyovers on Veterans Day weekend in Santa Barbara, which are organized by Michael “Viper” Maloco. The attendees’ experience spans from military flying in World War II, in which attendee Air Force Colonel Hugh Dow served, to more recent wars as well as commercial flying.